Public Serving Warning to Readers: When waiting for the red light to change at the intersection of Marine Drive and Taylor Way, do not – I repeat DO NOT – pick up your i-phone. There is a high probability that a police officer will tap tap at your window, ask you to navigate across three lanes of similarly stalled traffic, ask you to wend your way along Marine Drive into Park Royal North, where after a suitable pause for penance and guilt, you will be handed a ticket for $167. For distracted driving. You have been warned! This is a particularly awkward confession since recently I was asked to substitute for the Attorney General at a major government announcement on the perils (and expensive legal consequences) of paying attention to those electronic gadgets and not the road. The event took place in the parking lot outside Science World in Vancouver. Not far from where I grew up, actually. There was a full turnout of media, cameras, insurance executives, and police force upper management. 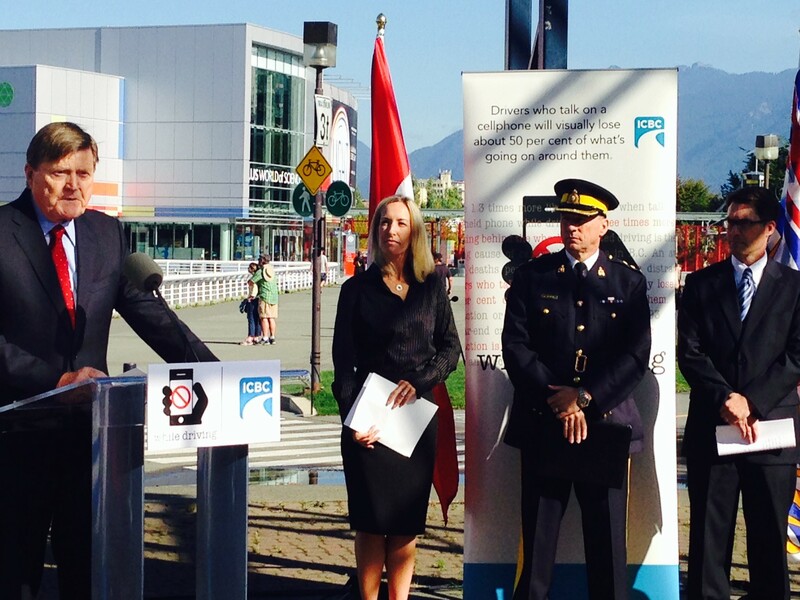 I announced that government is taking steps to protect British Columbians from distracted drivers on the highways. It is hoped that stiff penalties will change people’s behavior. The government is adding three penalty points for drivers who are caught talking on a handheld device, in addition to the fine. In 2012, 81 highway deaths were attributed to distracted driving in BC. This is a lot more than the mere 55 deaths attributed to alcohol and other intoxicants. BCAA has identified teen drivers as a particular risk. Talking on the phone increases crash risk by a factor of four; texting by a factor of 23! A few moments watching the creeping queue at Marine Drive and Taylor Way will reveal many drivers who have not got the message. At my formal Science World announcement an RCMP officer illustrated how he sees drivers all the time hunched over the wheel and texting with two hands. Sure enough, at the end of the announcement, I drove onto Main Street and in front of me there was a driver in a beat-up pickup truck hunched over the wheel and texting with two hands. For the benefit of the media, a Vancouver police officer started pulling over the easy pickings on Main Street. But then, it seems to me, he got bored and left. Shooting fish in a barrel. The public policy question remains: how do we keep people from killing themselves and others? Recently I trundled over to the modest mansion on the hill, Government House in Victoria, complete with porte cochere (covered driveway entrance) and grounds where the biggest issue is the deer who eat the roses. It is where our splendid Lieutenant Governor, Judith Guichon, hangs up her spurs when she rides down to Victoria from her Cariboo ranch. I went to watch a very special group of British Columbians receive the Order of BC, “our province’s most prestigious accolade,” as the Lieutenant Governor described it. Douglas Coupland is a writer, designer, visual artist and global change-maker. His global fame was assured when in 1991, only 30 years old, he wrote the prescient novel Generation X. He continued to write, 14 works of fiction and four works of non-fiction, several published in 35 languages. In his spare time he is also a sculptor, painter, playwright, filmmaker, and clothing and furniture designer. He is a tart social commentator. (I vividly recall his graphic of our North Shore, viewed from Stanley Park, showing wall-to-wall skyscrapers stretching from North Vancouver beyond Ambleside.) He is an artist of immense range, an inventor and an internationally-known cultural figure. In short, a modern Renaissance man. His commendation read “He has changed our viewpoint of life.” Yes indeed. Not just in West Vancouver but globally. Barry Marsden is the kind of person I idolized as an early balsa-wood-and-tissue-paper model airplane builder. Barry began his aviation career in 1959 as a pilot and aircraft maintenance engineer. He founded Abbotsford-based Conair and turned it into a world leader in aerial firefighting — tactics, equipment, and implementation. Conair provides aerial firefighting services world wide and converts conventional aircraft into fire-fighting tankers. With his cadre of skilled technicians, he formed Cascade Aerospace in 2000. Cascade is now an advanced technology aerospace and defence contractor and one of the largest employers in the Fraser Valley. He has received the “Medaille De L’Aeronautique” from the Government of France and exclusive pilot recognition in Britain. As our world continues to warm and our forests continue to dry, the experts caution us that wildfires will only get bigger and more destructive. Barry is in a growth industry. 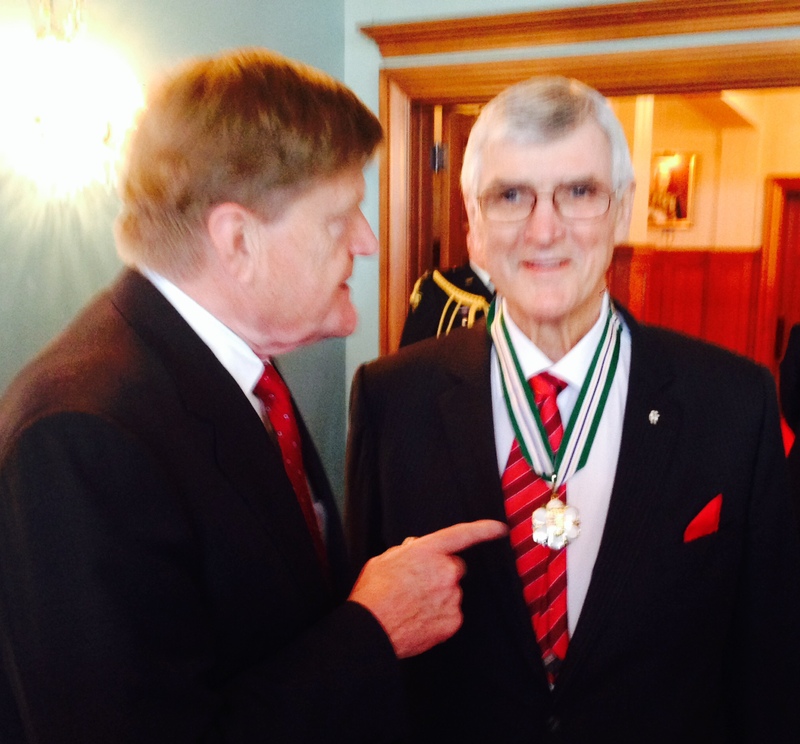 Pat Quinn received his Order of British Columbia only a couple of months before he died. He leaves a large imprint on our province and on our country. I recall bumping into him on a downtown street, and telling him “Pat, we love ya!” And so we all did, for his almost-within-our-grasp Vancouver Canucks drive for the Stanley Cup in 1994. The Canucks lost the deciding seventh game against the New York Rangers 3-2. It is played and replayed in sports bars all over town. This big Irishman’s game was hockey, he excelled as player, coach, and owner. Quinn is the only person to have coached and managed four different gold medal-winning teams. He won the hearts of hockey fans throughout our province. 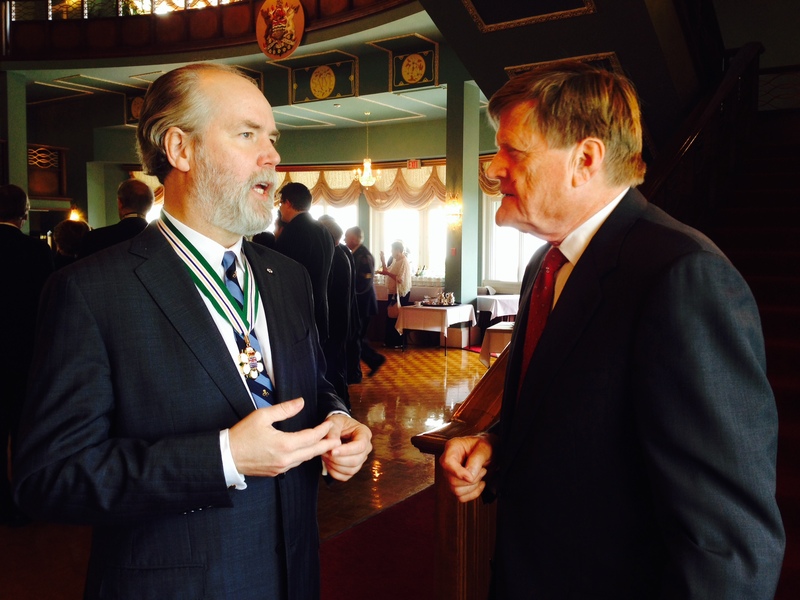 I chatted with him at Government House after he had received his medal. He seemed untypically frail; I did not realize he did not have long to live. He told me “You could have purchased the Canuck franchise for $30 – $40 million a few years ago. Today it is worth around half billion.” When I asked how many shares he owned, he said that unfortunately that was not on the agenda of the owner of the day. Part of my interview with Pat Quinn may be found below. Pat, may you continue to win the face-offs. Of the 23 Order of BC recipients this year, 3 are from West Vancouver. Hmm. Only 1% of the provincial population but 13% of the achievement. Either the fix was in at the independent selection committee level – or we live in a community of civic-minded achievers. I choose the latter interpretation. Something to be proud of. We are so fortunate to live in a community rich with leaders, innovators and entrepreneurs that make a significant difference. 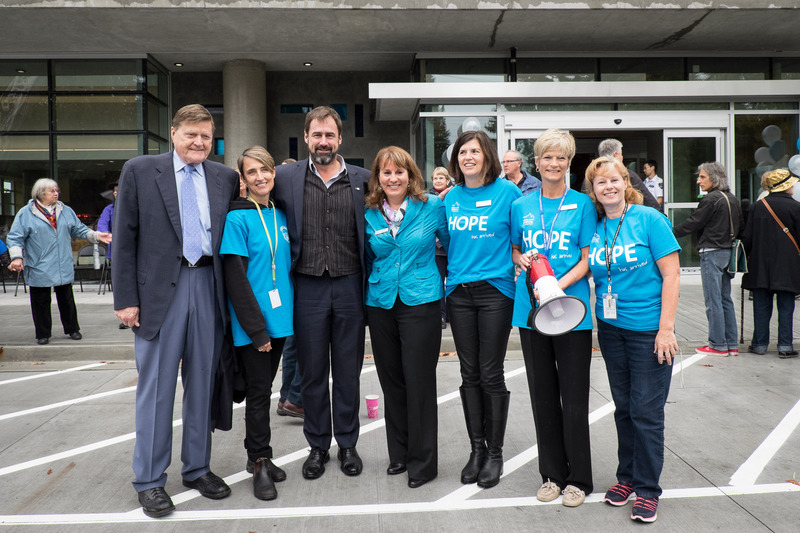 North Shore recently celebrated the opening of the magnificent new HOpe Centre at Lions Gate Hospital. The name “HOpe” derives from philanthropists Robert and Greta Ho who, along with the Ministry of Health and other private donors, paid the almost $60 million cost of this new 26-bed, four-storey psychiatric facility. Another significant North Shore philanthropist, Dr. Djavad Mowafaghian, contributed funding to provide teaching space for UBC Medical School. It is said that when watchful medical students linger around, everybody raises their game. Finally — completing the hospital hat trick — is a new nine-bay B.C. ambulance centre, complete with living quarters for waiting paramedics on the lower level. Services provided focus on mental health and addictions, since these disorders often present concurrently. Astoundingly, specialist Dr. Evan Woods has explained to me that addiction treatment is only now being added to the physician curriculum. MLA’s have their pulse on the community. We have learned that parents on the North Shore are anguished over the extent of mental illness among adolescents. Adults seem increasingly prone to depression and other disorders of the mind. There is a good reason this government has recently opened the new Brain Health Centre at UBC. Philanthropist Robert Ho, in visiting the old building on the Lions Gate campus — a structure even older than I am — observed that there were only a few rooms, gloomy and dark. In contrast, the new facility features good sight lines from the nursing stations, open space and light; even in the two rooms designed for maximum restraint. Capital funding set a new benchmark standard of approximately 60 percent government money and 40 percent private gifts. The Lions Gate Hospital Foundation, directed by the very capable Judith Savage, organized galas, golf tournaments and sidewalk lemonade stands to collect the required nickels, dimes and dollars. Benefactors are recognized on a wall of stainless steel plaques in the spacious foyer. Congratulations to the Vancouver Coastal and CEO Mary Ackenhusen, to the Foundation and to donors large and small. Mental health and addictions are moving out of the shadows for mainstream attention and recovery on the North Shore. 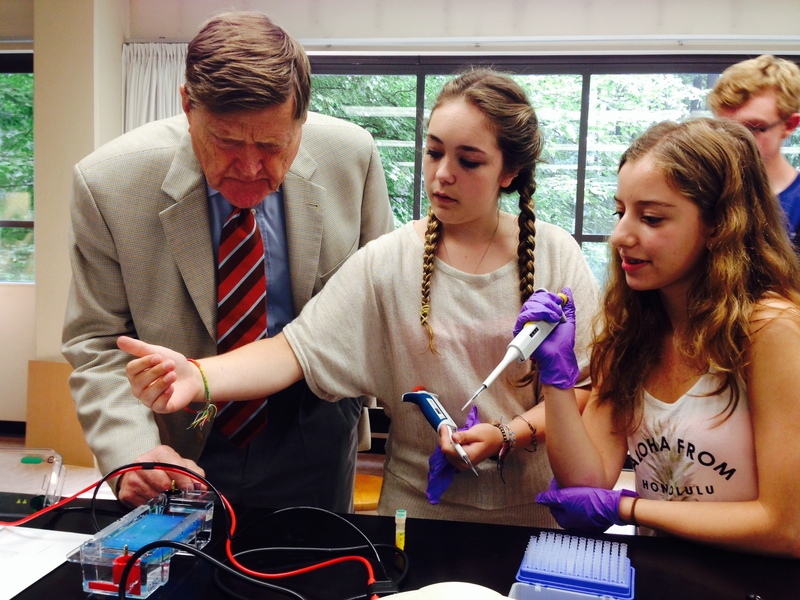 Gene skool is sponsored by Genome BC, and consists of “summer camps” run all around the province. The camp I attended was held one weekend at Capilano University. Local kids from grade 10 to 12. Boy, did they ever run circles around this Harvard graduate. Genome BC is not a bunch of scientists in white coats working in a laboratory – it is an investment fund backing scientists who do. Its portfolio emphasizes science and innovation. Headquartered on the VGH campus in Vancouver and funded by taxpayers and private capital, it is a major driver of BC’s life sciences cluster. It manages a cumulative 211 research projects in a $1/2 billion portfolio cutting across forestry, fisheries, agri-food, energy, mining, and the environment – as well as human health. The unifying theme is genes. British Columbia made the gene world sit up and pay attention in 1993 when our Michael Smith won the Nobel Prize for discovering “site-directed mutagenesis”; that is, how to make a genetic mutation precisely at any spot in a DNA molecule. What is DNA? Pretty important, actually. Your body produces billions of new cells every day. Each time one of your cells divides, it must first copy the genetic information encoded in DNA. Scientists now build molecular machines which can copy DNA. And that is the simple process I am going to try to learn more about by going back to gene skool at Cap U. Through experiments based on hypothetical case studies of crime detection and disease outbreaks, the kids at Cap U worked on the laboratory benches exploring themes such as DNA replication, protein and antibody synthesis and bacterial culture – stuff not yet part of any BC Ministry of Education curriculum. They also came to understand career options in a dynamic industry that feeds on the super-bright talent which showed up for gene skool at Cap. Fact is, they intimidated me as they patiently explained what was going on in the test tubes with spots of vegetables and spit. I joined up with a student team for a DNA separation demonstration and gained their perspectives on current genetic mysteries like West Africa’s Ebola virus outbreak and the fluctuations in BC’s Sockeye Salmon population. The local blog reported me saying “I just get excited listening to you describe the experiments that you run” and that was exactly my reaction. Meanwhile my MLA colleague Naomi Yamamoto helped students carry out antibody tests for infections such as anthrax and Legionnaires’ disease. Genome BC’s strong relationship with Capilano University goes back ten years and is largely due to the efforts of Biology Department Coordinator Marja de Jong Westman. Working closely with Genome BC’s Education Advisor Catherine Anderson and Capilano University biology instructor Ann Meitz, Maria was able to coordinate use of Cap’s labs throughout the year, such as during the summer and between academic terms. Congratulations Genome BC! Congratulations Cap U! Congratulations next Nobel Prize winners! Criminals, watch your spit!